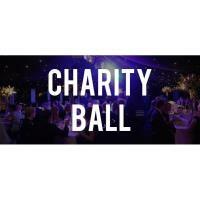 Tickets for the ball are priced at £70 a seat or £600 for a table of 10 to include food, drink and entertainment. This November something BIG is happening in Newquay. To celebrate 30 years of supporting the business community in Cornwall, Cornwall Chamber of Commerce is holding a 30th Birthday Ball at the Atlantic Hotel, Newquay. 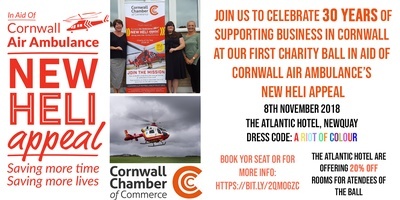 The birthday ball will culminate in a charity auction for the Chamber’s Charity of the Year 2018/19: Cornwall Air Ambulance. The Chamber has sourced some fantastic prizes – from hotel stays to meals and days out, there will be a variety of great gifts on offer, just in time for the festive season. The auction will raise money directly for the New Heli Appeal. Prosecco will be served on arrival, followed by a two-course dinner with wine. After dinner, guests can take to the floor with music provided by DJ in Cornwall.